Transform any Pita Sandwich on the menu into a great Meal with Saca’s Make-it-A-Meal option! For $3.19, you get a Fountain Drink or Large Iced Moroccan Mint Tea AND a cup of Lentil Soup, French Fries, Grilled Veggies or a cup of Rice Pilaf. It’s available all day, every day. Not in the mood to cook tonight? Saca’s Family Pack is a great option. It serves up to 4 people, includes 2 Entrees, 3 Sides (Rice Pilaf, Hummus and a 3rd Side of your choice), 4 pitas and 2 sauces. (*) Given how popular our Rotisserie Chicken is, we recommend you call in your orders 2 hours before pickup time. This is a Dinner for the Hungry! 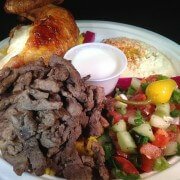 Served with Rice Pilaf, 2 pitas, 1 sauce and your choice of 2 Entrées, 2 Sides, and a drink. Don‘t miss Saca’s newest Deals!